I can hardly believe that it has been 5 years since I started this blog with a simple, and poorly photographed, recipe for granola. To my defense, it’s delicious and I still make it exactly as I made it then. 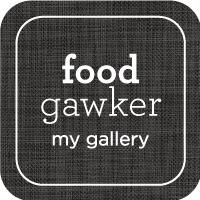 I started the blog to share my recipes with family and friends. Also, I was bored out of my mind during the 2010 snowmageddon! I’ve met some wonderful people through my blog and through social media, and developed close friendships. I wanted to do a special giveaway for readers of the blog. 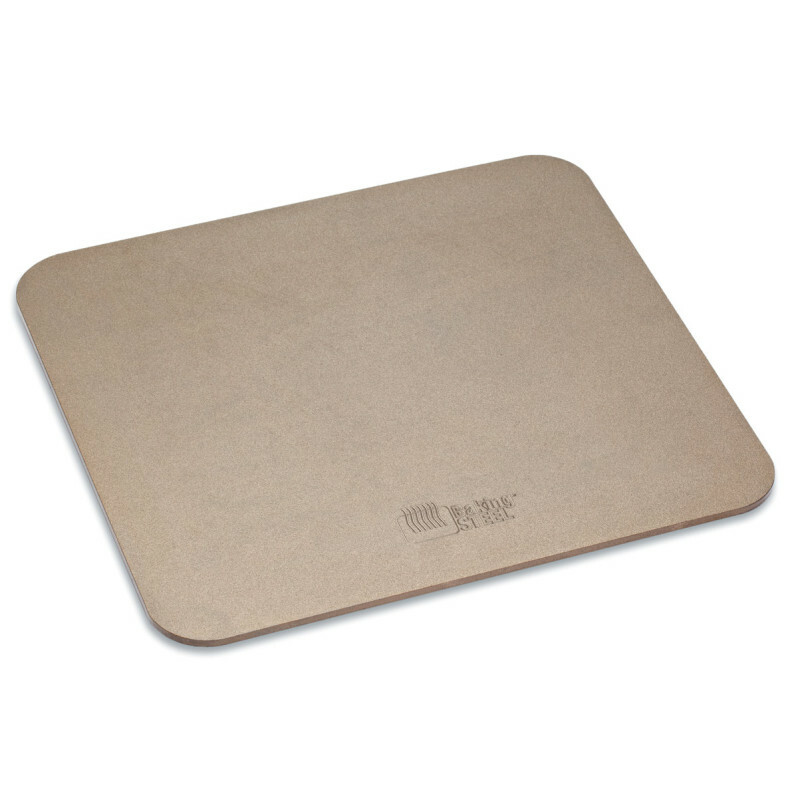 One of the kitchen items that I’ve been using a lot lately is the Baking Steel. The boyfriend got it for me as a Christmas gift, and boy is he happy he did! 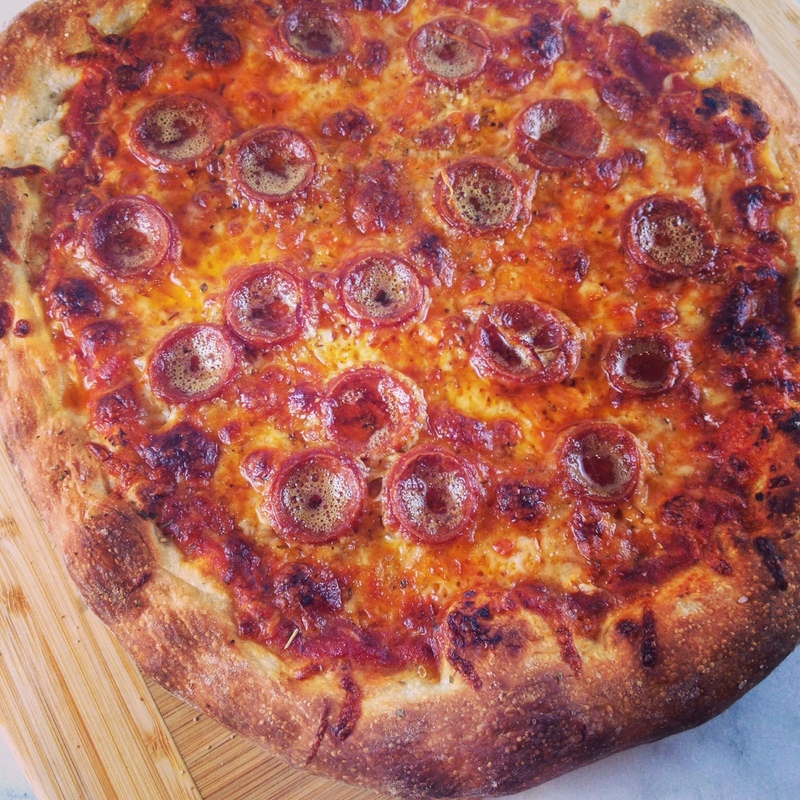 I’ve been obsessed with it, making all kinds of pizza: NY style pepperoni pizza, a simple Neapolitan style pizza, thin crust pizza, cheesy garlic bread… I can’t stop. The great news is that Baking Steel has kindly agreed to provide a Baking Steel to one lucky reader! Baking Steel started as a Kickstarter project. The concept is a simple one, the steel is a better conductor of heat, producing a better crust, and creating better oven spring for baked goods such as bread. The resulting crust is a thing of beauty. Leave a comment below telling me what is your favorite pizza combination. Optional: Follow me and follow Baking Steel on instagram. You must have a contiguous US address for shipping of the product in case you win. If you are one of those people who has social media accounts only to enter giveaways, you will be disqualified. This is not an opportunity for you to go resell something on ebay. I will randomly pick a winner on February 14th. 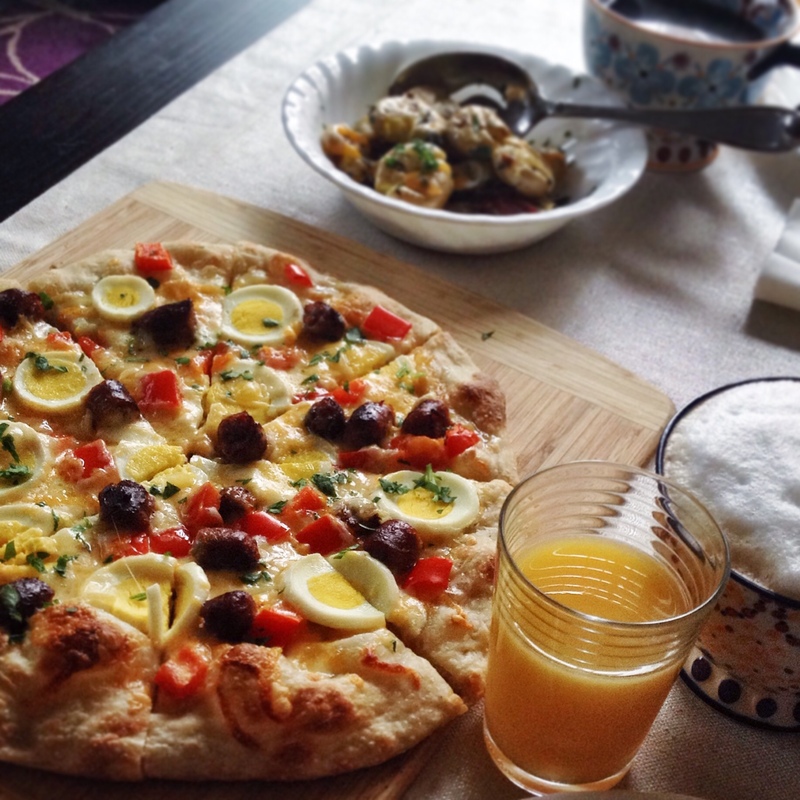 Now I leave you with a recipe for my latest obsession: breakfast pizza. Thank you for visiting my blog and for following along for the past 5 years! Remove the dough from the refrigerator 1 hour prior to using. Pre-heat Baking Steel in the oven according to manufacturer’s directions. Place the mozzarella cheese and the cheddar cheese in a small container and freeze while you are pre-heating the oven. Stretch dough to a 9 inch circle, making the edges a bit thicker than the rest. Place on a pizza peel sprinkled with cornmeal. Sprinkle mozzarella and cheddar evenly on the dough. 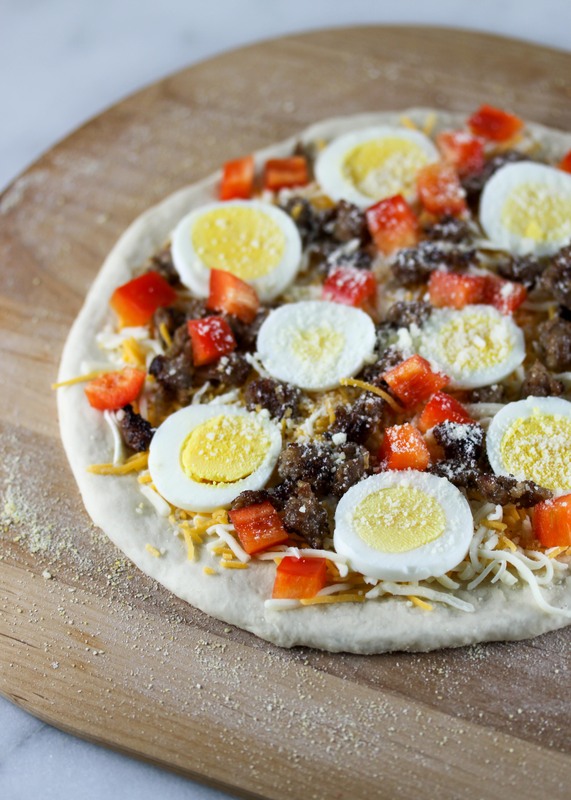 Top with the crumbled sausage, sliced boiled eggs, and bell pepper. Sprinkle with Parmesan cheese. Tip on your baking steel and cook for about 10-12 minutes, rotating the pizza once halfway through cooking time. Remove the pizza from the oven, and sprinkle with chives and truffle oil if using. Note: If you don’t have a Baking Steel (yet) or a pizza stone, you can pre-heat a cookie sheet in the oven at 500F degrees for about 15 minutes. Make sure to place the cookie sheet upside down in the oven. Prepare your dough on parchment paper, and slide the parchment paper with the pizza onto the pre-heated cookie sheet. Cook 12-15 minutes at 450F. The crust won’t be as crispy and crunchy, but it will still be delicious. Disclaimer: Baking Steel kindly agreed to provide one free Baking Steel for the winner of this giveaway. I was not compensated for writing this post. All views are my own. **Update** 2/14/15 The winner of the Baking Steel is Kaoru! Happy 5th blog birthday! I love fresh mozzarella and spicy sausage on my pizza. OOOOH!!! All the pizzas. I love thin crust with olives, roasted peppers, mozzarella, and fresh basil. It’s always amazing to see how someone has come from where they started!! I love pizza and the pizzas you pictured with the baking steel look AMAZING! Already following you, but I followed them as well. I love pepperoni and bacon on my pizza! I love Bianca Pizza! 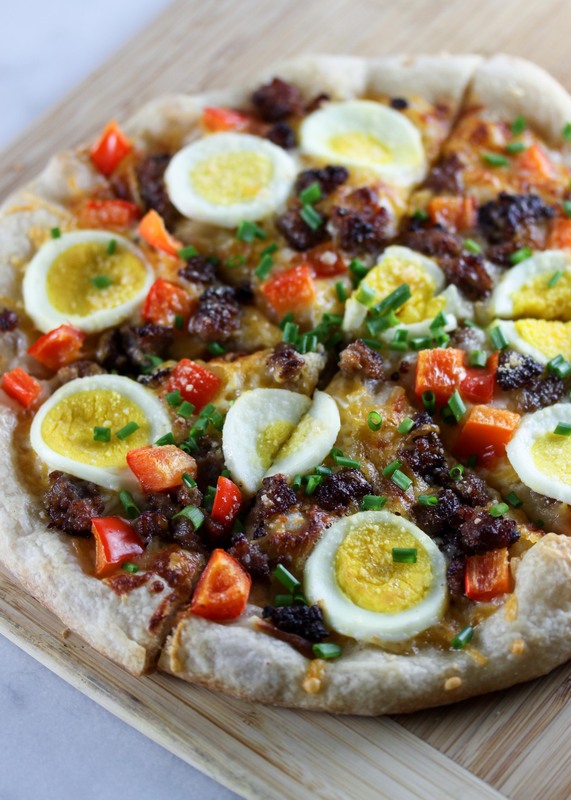 But ant pizza with a runny egg is tops! My favorite? Oh that’s difficult. A Margherita can be oh so satisfying, especially with really good cheese and home grown, just picked basil. And when I have home grown tomatoes I like to use them instead of sauce. A white pizza with prosciutto and arugula is pretty awesome too. And then there’s an old Gourmet Magazine recipe for Shrimp Creole Pizza that uses smoked mozzarella. Since I discovered type “00” flour my pizza game has really been elevated. What a difference this flour makes. I love a good margherita pizza or just plain pepperoni! Sometimes the simple stuff is the best! I’ve never heard of a baking steel before! Definitely an interesting idea. My favorite pizza combination is a classic Mediterranean blend: artichoke hearts, onion, black olives, and red pepper. So good. Thanks for the giveaway opportunity! I love pizza more than any other food, its such a versatile meal, a blank palate mind you. I’ve already thrown together a pizza with leftovers in the fridge and it turned out awesome. My favorite pizza starts with a thin layer of olive oil, minced garlic, fresh spinach, feta cheese, sundried tomatoes (homemade are the best), pine nuts, mozzarella and chopped basil leaves. Some people are nervous because it doesn’t have red sauce but it is totally awesome, a must try! I love roasted garlic on my pizza! It is the best with caramelized onions and roasted red peppers but I will take it with any combination! My favorite is white pizza with arugula salad on top! And homemade all the way! I like to make a pizza with eggplant and parma ham, no cheese! (though I make cheese pizzas too). It’s pretty great. I follow you both on instagram, I am @margotcore there. I am following both on instagram. My favorite combo is mushroom and pepperoni. My husband and I can never get enough of homemade margherita pizza! A delicious classic! Favorite pizza is combination is garlic, assorted grated leftover cheeses, roasted tomatoes, green olives, topped with salad greens and prosciutto and drizzled with olive oil. Following both on Instagram. Oh, and, congratulations on 5 years as a blogger!!! Exciting! My favorite pizza combination is pepperoni, hamburger, sausage and onions. Happy 5th! I love fresh mozzarella, spicy sausage, and jalapeños on my thin crust pizza! 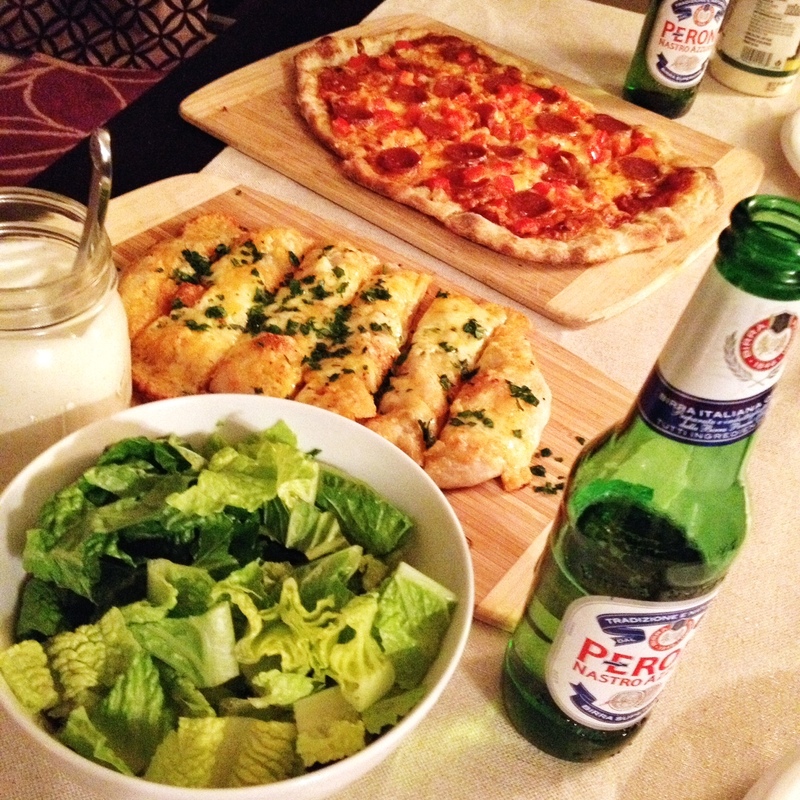 Favorite pizza combination is peperoni, sun dried tomatoes and mushrooms on mozzarella!